Anybody in the area of Dunure Cemetery or due to survey it? I would be most grateful for a photograph of the grave of Flight Captain, The Hon. Margaret Fairweather and her Husband Captain Douglas Fairweather both WW2, Air Transport Auxiliary. Grave Sctn.E (White) No.295. Margaret was the daughter of 1st Viscount Runciman of Doxford. I will be at Dunure in the morning and will take these photographs for you. Here is the only grave for the Air Transport Auxilliary Unit in this cemetery containing the remains of the below mentioned. Additional information: Son of Sir Wallace Fairweather and Dame Margaret Eureka Fairweather, of Glasgow; husband of Flight Captain the Hon. Margaret Fairweather,. Grave/Memorial Reference: Sec. E. (White) Joint grave 295. Additional information: Daughter of the Rt. Hon. Walter Runciman, P.C., D.C.L., LL.D., J.P., 1st Viscount Runciman of Doxford, and of the Viscountess Runciman of Doxford, J.P. (nee Stevenson), of Doxford, Northumberland; wife of Capt. 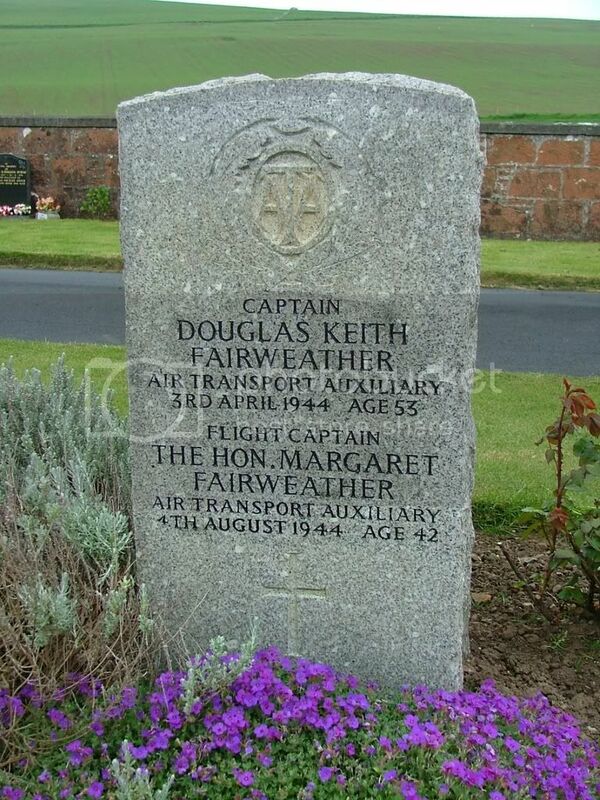 Douglas Keith Fairweather, Air Tpt. Aux. Most welcome, thank you very much. Is this photo in the existing Dunure Cemetery thread? If it is, can we avoid duplication of threads? This request should also have been posted in the "Queries and Requests" section and NOT in the main photos section.